Clean respirators and personal safety equipment quickly and easily. Premoistened isopropanol-alcohol pads cut through dust and grime while sanitizing all smooth nonporous surfaces. Individually wrapped packaging provides extra convenience. Towel/Wipe Type: Cleaner/Detergent Wet Wipe; Application: Respirators; Safety Equipment; Applicable Material: Glass; Metal; Plastic; Plexiglas; Rubber; Material(s): Non-Woven Synthetic Fiber. 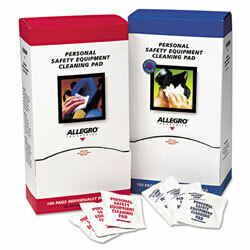 Cartridge Respirator Parts and Accessories from Allegro! 42 In Stock today.